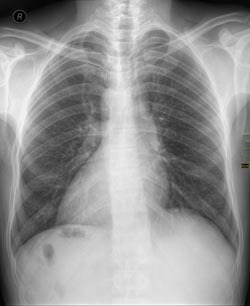 X-Ray of an SCP-3331-1 instance exhibiting situs inversus. Special Containment Procedures: SCP-3331 is to be stored on a secure pedestal in the centre of a containment chamber measuring at least 5m3. Instances of SCP-3331-1 are to be contained in standard humanoid containment chambers. For more information regarding SCP-3331-1-Alpha and Operation Glass Ring, see Sub-document 3331-1/12. Description: SCP-3331 is a Sesame Street branded electronic child's toy with 10 numbered buttons and a simple lenticular panel depicting a stylised phone screen. It constantly emits a series of audible tones in a range typically associated with standard telephone key tones. This occurs regardless of the presence of batteries or any other power source. Approximately once every three months SCP-3331 will produce four notes played by a brass horn instrument, consistent with the opening horn section of "The Night The Lights Went Out In Georgia", by Pete Schofield and the Canadians.1 An instance of SCP-3331-1 will then manifest in an open space within 2m of SCP-3331, pick it up and hold a brief conversation as though it were a functional telephone.2 Once finished, this SCP-3331-1 instance will attempt to seek out and attack the nearest other instance of SCP-3331-1, and will become increasingly distressed and erratic in its behaviour if it is prevented from doing so. There are currently 26 instances of SCP-3331-1 in containment. SCP-3331-1 is a humanoid entity with the appearance and physical characteristics of American professional wrestler John Cena. All instances suffer from situs inversus3, and approximately 70% display additional anomalous properties. Interviews suggest that instances possess memories that closely mirror those of John Cena at the time of manifestation, though their personalities and behaviours have been seen to differ significantly. Table 3331-A contains examples of SCP-3331-1 instances. John Cena was interviewed shortly after the discovery of SCP-3331's anomalous properties, under the guise of investigating a potential stalker, though he appeared to have no knowledge of or connection to SCP-3331. He remains under observation. Notable examples of instances of SCP-3331-1, categorised by instance number. 1 None. Personality profile closely matches that of John Cena. 6 A memetic effect that causes observers to perceive it as being approximately 70cm taller than themselves. Effect translates through video recordings; actual height presumed to match that of John Cena, but cannot be confirmed. Prone to seemingly random bouts of megalomania, typically expressed in the form of "wrestling promo" style monologues. 13 Possesses low-level psychic abilities that allow it to predict the physical movements of nearby individuals. Suffers from Antisocial Personality Disorder, and has been observed to use its anomalous properties to inflict severe physical injuries on containment personnel. Consequently, Instance 13 should only have direct contact with personnel rating 85 or higher on the Psychic Resistance Scale. 14 Able to manipulate the flow of time in the area immediately surrounding its body, allowing it to move extremely quickly or extremely slowly from the perspective of those observing it. Suffers from a unique psychological disorder related to the way it perceives time. Currently under analysis. 18 A highly durable and malleable skeletal structure, making it highly resistant to physical trauma and allowing for a wider range of movement than the human skeleton typically allows. Attempted escape a number of times by compressing its skeleton to such a degree that it could enter spaces too small for a typical human of its size. 23 When directly engaged in any form of game, contest, or challenge, Instance 23 will always win, regardless of any prior experience in the specific game or how many other participants there are. It is extremely egotistical, believing its victories to be the result of natural skill, and will regularly try and bait Foundation staff into contests through personal insults. Under no circumstances is language that would conflate its containment with a game or challenge to be used around Instance 23. SCP-3331 was recovered on 23/08/2010, when automated internet analysis bot I/O-TIGER flagged potential anomalous activity; a forum post describing a "toy kids phone that keeps on beeping even after the batteries are out" combined with a number of sightings of John Cena in the area, when John Cena himself was confirmed to be elsewhere. Investigation revealed the poster to be a nurse at ██████ Hospital, ██, and that the object belonged to a terminally ill child who was visited by John Cena in 2007; it had been left in storage following their death. On 17/11/2017 John Cena made contact with the Agent who performed his original interview via a supplied phone number, to report seeing a person who "looked a lot like him" outside of his home. Agents were dispatched to investigate, and he was brought in for a second interview, transcribed below. Cena: Detective Li, good to see you again. Li: Mr. Cena. I understand you're having trouble with a stalker? Cena: Yeah, saw someone sneaking around outside my house a couple of nights ago, and I remembered what you said the last time about calling you if anything came up. Li: Of course. Can you describe this person? Cena: He looked like me. For a few seconds I thought it was just my own reflection in a window. That's weird, right? Li: Did he do anything? Cena: No, he uh, I think he ran when he noticed I'd seen him. Li: Have you seen him around before? Or anyone who looked like him? Cena: Looks like me, you mean. Cena: You'd think I would remember seeing someone who looks exactly like me before. Cena: Unless you'd wiped my memory of it, of course. At this point, video footage shows Agent Li become frozen in place, as though unable to move. Cena: Come now, Agent Li. We both know you wouldn't be displaying such an incredible lack of subtlety if you weren't planning on having me forget the entire thing after. What is it you call them? Cena: Ah yes, amnestics. Strange name. Cena: How am I doing this? Oh, I have a great many gifts. Less than I'd like, of course, since you cut off my supply. I was content with what I had for a while, obviously. Easy to be the best John Cena when there's no other competition. Security alarms begin to sound. Cena: Ah, looks like our time is up. No matter, I have what I came for. Cena taps the side of Agent Li's head. Cena: See you around, Agent Li. You won't see me, though. Heck, you can't see me. Cena disappears from sight. Agent Li collapses to her knees and gasps. John Cena, now classified as SCP-3331-1-27, was tracked briefly through the use of thermal imaging; it was seen passing directly through the walls of the facility until it left the building, at which point it appeared to vanish entirely. Approximately seven minutes later, Site-724 reported a number of security breaches involving SCP-3331-1-27 and the other instances of SCP-3331-1. 11 instances of SCP-3331-1 were killed before security personnel could respond and Instance 27 left the Site through unknown means. Security footage showed it exhibiting an effect consistent with now deceased Instance 6. No Foundation personnel were injured during this incident. Analysis of the thermal imaging footage along with a single captured X-Ray5 shows a 67% chance that Instance 27 suffers from situs inversus. Investigation of John Cena's home revealed a hidden basement equipped with a makeshift wrestling ring. Buried beneath the ring was a mass grave filled with the bodies of 15 other SCP-3331-1 instances in advanced states of decay. Each appeared to have died from extreme trauma consistent with injuries sustained during wrestling. A number of the corpses continued to display evidence of anomalous properties. Due to the difficulty associated with removing a personality as well known as John Cena from public knowledge, it was deemed more efficient to replace him with one of the non-anomalous SCP-3331-1 instances. SCP-3331-1-1, now classified SCP-3331-1-Alpha, has replaced John Cena following a regime of amnestics, memory therapy and physical conditioning. See documentation on Operation Glass Ring for more details. The locations of Instance 27 and the original John Cena, now classified PoI-46532, remain unknown. 1. This series of notes is more commonly known in popular culture as the introduction theme song for Professional Wrestler John Cena. 2. Conversations typically consist of simple affirmative statements, for example "Yes, I understand," and "Of course," and typically last for approximately 20 seconds. Recording devices have picked up no additional audio from SCP-3331 during these conversations. 3. A condition in which the major organs of the body are reversed from their normal positions. 4. The facility containing SCP-3331 and the instances of SCP-3331-1. 5. X-Ray capability was present in the cell of Instance 21, as part of its containment.